Aspergillus fumigatus is an opportunistic fungus that mainly affects immunocompromised patients. 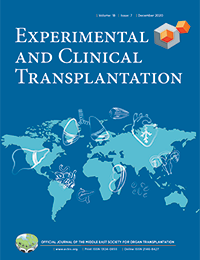 Due to significant immunosuppressive therapy, patients who undergo orthotopic heart transplant have an increased risk of infection. Aspergillosis is the most common fungal infection in orthotopic heart transplant recipients (70%) and usually presents as invasive aspergillosis, which has a rapidly progressive course and is highly fatal. In heart transplant patients with invasive aspergillosis, overall mortality may range from 53% to 78%. Aspergillus mediastinitis infection is somewhat rare in orthotopic heart transplant recipients, with only 6 reported cases. Treatment may require early surgical drainage and antifungal therapy. We present the case of a 50-year-old man who developed Aspergillus mediastinitis 1 year after heart transplant surgery. This case illustrates the diagnostic challenge of an atypical presentation of Aspergillus mediastinitis and the importance of multiple drainage procedures in refractory disease, combined with long-term antifungal therapy. One year after heart transplant surgery, a 50-year-old man who was receiving treatment with daily oral tacrolimus (3 mg in the morning and 2 mg at night) and prednisone (10 mg twice daily) presented to the emergency room with dysphonia of 1-month duration and a mild cough. The patient did not have any other respiratory symptoms, fever, or chest pain. His postsurgery recovery had been complicated by constrictive pericarditis 6 months after heart trans­plant, which had been treated with oral colchicine (0.6 mg/day) and increasing doses of prednisone. His past medical history included arterial hypertension and type 2 diabetes mellitus. A biochemistry analysis revealed an elevated erythrocyte sedimentation rate (110) and elevated C-reactive protein level (49 mg/L; reference level of 0-10 mg/L). An otorhinolaryngology consultation for dysphonia revealed left vocal cord paralysis, raising suspicion for a recurrent laryngeal nerve com­pression. Nuclear imaging of the chest was per­formed, with positron emission tomography (PET) scan revealing hypermetabolic lesions with central necrosis in the mediastinum (Figure 1) without any pulmonary infiltrates. 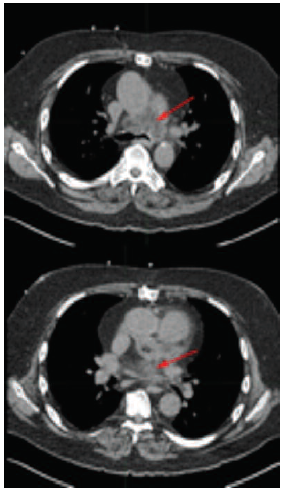 A thoracic computed tomo­graphy (CT) scan demonstrated a mediastinum fat infiltration of 5.6 × 4.7 × 3.5 cm at the same level of the aorticopulmonary angle, behind the aorta, raising suspicion for a posttransplant lymphoproliferative disorder (Figure 2). Immediate management included a biopsy of the fat infiltration guided by endobronchial ultraso­nography. Cytology of the lesion was negative for neoplasia but revealed the presence of Aspergillus species filaments. Culture of the biopsied material confirmed an Aspergillus fumigatus infection. Sputum fungal culture was collected and was negative. Treatment with intravenous voriconazole at 6 mg/kg twice daily for 24 hours followed by 4 mg/kg twice daily was promptly initiated. Two days after the patient was started on the voriconazole regimen, on and off fever was noted. Intravenous voriconazole was then switched to oral voriconazole 1 week after start of intravenous treatment due to the onset of progressive renal failure (creatinine level was 150 to 262 μmol/L [normal range ≤ 150 μmol/L]). Dose was adjusted regularly to achieve trough concentration of between 2 and 5.5 mg/L. A repeat thoracic CT scan revealed an incremental expansion of the infiltration area and the presence of mediastinal cavitations, compatible with progression of the infectious process. Aspergillus galactomannan antigen test was negative (0.43, negative if < 0.5). A decision was made to keep the patient on oral voriconazole and to perform surgical drainage of the lesion. To avoid contamination of the pleural cavity, a mediastinoscopy was performed. A large purulent collection was drained, and a drain was left in place. Intravenous caspofungin 50 mg/day was then added to oral voriconazole therapy. Four days later, caspo­fungin was ceased because of liver cholestasis (gamma glutamyltransferase level of 493 IU\L [normal range ≤ 45 IU/L], lactate dehydrogenase level of 663 IU/L [normal range ≤ 245 IU/L], alkaline phosphatase level of 165 IU/L [normal range ≤ 130 IU/L], aspartate aminotransferase level of 45 U/L [normal range ≤ 40 U/L], and alanine aminotransferase level of 33 U/L [normal range ≤ 88 U/L]). The patient’s condition improved immediately after the procedure; however, fever returned 5 days later. A thoracic CT scan revealed an increase in size of the infiltration area with cavitations. Repeated galactomannan test remained negative (0.39). A second mediastinoscopy was performed to drain the purulent collection, and an irrigation-aspiration system was installed. The patient’s general condition improved immediately. However, fever returned again 1 week later. Thoracic CT scan confirmed the presence of a new infiltration close to the pulmonary artery, and a beta-D-glucan test was positive (395 pg/mL, positive if ≥ 80 pg/mL), although Aspergillus galactomannan test was still negative. This time, however, a right thoracoscopy was performed to drain the mediastinum. Cultures of the drained material were negative for the presence of Aspergillus. Liposomal amphotericin B was initiated, and voriconazole was ceased. Two weeks later, the patient was discharged from the hospital (after a hospitalization of 66 days), as supported by the absence of progression of the infection on serial CTs, absence of fever for several days, and a good general status. The patient left the hospital with voriconazole 250 mg twice per day and close follow-up. Two months later, beta-D-glucan test became negative (64), and repeated CT scans showed a regression of the mediastinal infiltration. Ten months after initiation of antibiotic treatments and surgical drainage, CT scans showed complete regression of the mediastinal infiltration. Twelve months after the beginning of voriconazole therapy, the patient complained of pain and weakness of the proximal limb. Voriconazole toxicity was then questioned, and the antifungal was ceased as supported by negative CT and negative PET scans. The patient fully recovered several days after discontinuation of voriconazole. One of the greatest challenges with this condition is the diagnosis. Two laboratory tests are currently available for Aspergillus diagnosis: the serum 1,3- β-D-glucan test (sensitivity of 67% to 100%, specificity of 84% to 100%) and the serum Aspergillus galac­tomannan test. For the latter test, the accuracy is believed to be largely influenced by the immune system of the patient (sensitivity of 67% to 100% in immunosuppressed patients, sensitivity of 15% to 30% in immunocompetent patients, specificity of 97%).1 In our patient, the lesion was accessible by endobronchial ultrasonography, which enabled us to confirm our diagnosis with cytology and culture of biopsied material. Aspergillus mediastinitis is a rare and serious condition for which prompt diagnosis can be lifesaving. Treatment may require early surgical drainage and antifungal therapy. Our presentation of a 50-year-old man who developed Aspergillus mediastinitis 1 year after heart transplant illustrates the diagnostic challenge of an atypical presentation of this disease and the importance of multiple drainage procedures in refractory disease combined with long-term antifungal therapy. Singh N, Paterson DL. Aspergillus infections in transplant recipients. Clin Microbiol Rev. 2005;18(1):44-69. Caballero MJ, Mongardon N, Haouache H, et al. Aspergillus mediastinitis after cardiac surgery. Int J Infect Dis. 2016;44:16-19. Levin T, Suh B, Beltramo D, Samuel R. Aspergillus mediastinitis following orthotopic heart transplantation: case report and review of the literature. Transpl Infect Dis. 2004;6(3):129-131. Forestier E, Remy V, Lesens O, et al. A case of Aspergillus mediastinitis after heart transplantation successfully treated with liposomal amphotericin B, caspofungin and voriconazole. Eur J Clin Microbiol Infect Dis. 2005;24(5):347-349. Byl B, Jacobs F, Antoine M, et al. Mediastinitis caused by Aspergillus fumigatus with ruptured aortic pseudoaneurysm in a heart transplant recipient: case study. Heart Lung. 1993;22(2):145-147. Chou NK, Wang JL, Chi NH, et al. Surgical treatment of mediastinitis after cardiac transplantation. Transplant Proc. 2008;40(8):2629-2630. Pelaez T, Munoz P, Guinea J, et al. Outbreak of invasive aspergillosis after major heart surgery caused by spores in the air of the intensive care unit. Clin Infect Dis. 2012;54(3):e24-31. El-Sayed Ahmed MM, Almanfi A, Aftab M, Singh SK, Mallidi HR, Frazier OH. Aspergillus mediastinitis after orthotopic heart transplantation: a case report. Tex Heart Inst J. 2015;42(5):468-470. Aksoy F, Akdogan E, Aydin K, et al. Voriconazole-induced neuropathy. Chemotherapy. 2008;54(3):224-227. Acknowledgements: The authors have no sources of funding for this study and have no conflicts of interest to declare.